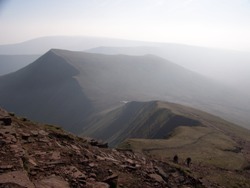 An awesome weekend's trek that will see us trek out and around the amazing Pen Y Fan Horseshoe, and across the outlying peaks of Cribyn and Fan Y Big, before dropping back down into the Usk Valley. Here we shall spend one night under canvas (tents provided). The following day we shall be climbing high once again over on to the Black Mountains to summit the final peak of Pen Alt Mawr - before dropping back down again to our final rendevous point, for tea! The total ascent for this challenge is over 2000m, meaning it is like climbing one and a half times Ben Nevis - but in addition, we are also covering a hefty 50km - or just over 30 miles. This is no mean feat - and will take us up to a full 8 hours each day. But come the end of this challenge you will have linked together the two finest ranges of hills in South Wales - and will be the proud completer of the unique Beacon Black Mountain Traverse. Don't take this one lightly - it is a serious event - and deserves training and focus to see it through. 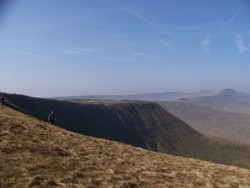 Walk encompassing the classic Brecon Horseshoe of Pen-Y-Fan, Corn Ddu, and Cribyn, this is a route to remember. Walk may include river crossings and possible encounters with boggy terrain!!! Expected arrival back in Usk Valley - around 17:00 - to strike camp - and then head out for dinner. You'll probably be thinking about an early night! In Crickhowell we shall convene in a local pub for some well earned refreshments! Drivers return to collect cars. Team depart in the evening to home. Team highly recommended to share driving on way back - and to take some caffeine on board. A good campsite with washing facilities is included for Saturday night (although washing facilities may be busy!) You will need to bring towel (if you would like to wash!) and a warm sleeping bag. Your breakfasts are also provided. Adventure Café will provide tents (2-3 man) and you will be expected to share a tent with a fellow participant. Pre-event information pack, Qualified Mountain Leaders (& trained assistants if necessary), appropriate safety equipment, return transfers at the end of the challenge for drivers, tents & campsite, breakfast. At most times of year the weather can go either way from warm temperatures to freezing cold – so be ready for anything – make sure you pack according to the list! Remember that layers are the key, allowing you to adjust your level of warmth more easily. We will almost certainly experience a little rain during the weekend, so make sure you have suitable waterproof gear—both jacket and trousers.